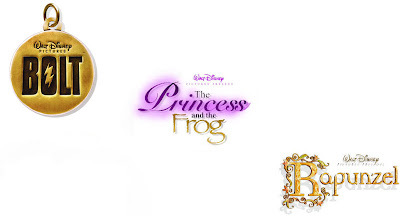 for that you have to wait for "The Princess and the Frog" in 2009. That will be a return to the grandeur of those classic "Princess" films. I've heard the people working on this production and "Rapunzel" are impressed at the strong narrative Lasseter has got the story crews working on. They're sweeping, epic and classic fairy tales that will sure to please veteran animation lovers and create a whole new generation of animation fans. The artwork for "Princess" is said to be stunning and Rapunzel's moving painting look is going to take CG into new terrain. For those of you that think Rapunzel is a reversal of making hand drawn animation, fear not... Lasseter has been looking over several pitches and is about to approve the second hand-drawn animated feature of his reign. So please don't judge "Bolt" by that one pic. Judge it by the film you see in a darkened theater this November. If what I've heard is correct, many of you doubters will become true believers. Don't you think John Lasseter deserves you wait until you see his first production before you declare it a failure? Because he looks like Scrappy Doo. At any rate, if the problem with American Dog / Bolt was the story why then would they change the amazing character designs that Sanders came up with? Just change the story and leave Scrappy Doo out of it. Hey...the movie's got a hamster in it! I think that's a first for Disney. I personally can't wait to see it. Thanks for the article, Honor. Looking forward to these. Any word on the release dates of Princess and the Frog and Rapunzel? I read something about Frog not being released until March 2010 because Bob Zemeckis's Christmas Carol was taking the winter slot in 2009. And since Toy Story 3 is being released winter 2010, does that mean Rapunzel will be shown summer 2010, or will it be pushed to 2011? "It's meant to be an endearing story that evokes what made Disney stories so charming back in the early days of Disney feature animation"
Uh, to my recollection, that would include Snow White. This don't look like no Snow White to me. I can't wait for everyone to start considering Pixar films as Disney films. There is no difference any longer! Steve Hulett, an Animation Guild representative has his own blog, the Animation Guild Blog, and he visits Disney Animation Studios every week or so. What he's mentioned about Bolt coincides pretty well with what Honor's written. I am very excited about all this new animated Disney movies. Including Bolt. The problem with that picture is: it's looks to generic. Without a personal touch (this is frequent in this marketing images). But I have total confidence that the creators at Disney Animation are doing a good job. I believe that when we see Bolt animated will be great and full of life. It's possible for Disney have two structures? One for hand drawn animation and other for CG animation. How John and Ed will manage this ? A post about this would be great Honor. gnomeo, are you sure about what you said? Expecially about The Snow Queen as the top secret next 2d project? Do you know that there are people that would die for a news like this? I really hope you are right!!! Hi!! I know you from a italian forum!! I´m not really sure! But 'Snow Queen' is in storyboards revision by Lasseter last April 2007 or summer 2007 and Ramayana is only a rumor for 2012 with Musicana (a new Fantasia) because Disney/Pixar trilogy 'John Carter of Mars' for 2012 too, will be a live action film with background-animation and its for to present two animated movie each year. But... for disney 2011? I Think will be Snow Queen because is the favourite fable of Lasseter. PD: Sorry for my english. I´m spanish and i know talk French and to write initalian. "I can't wait for everyone to start considering Pixar films as Disney films. There is no difference any longer!" Pixar animators work in San Fran. Disney animators work in Burbank. Just because they change the corporate banner in front of the film doesn't mean that this will change the quality of the film. Management, directors and even artists are different from one location to another. In fact, 'BuenaVista pictures' is owned by Disney, but they don't want you to call them 'Disney pictures' because they contain things like violence... and violence is bad for the 'Disney' name. Names are just Names. Who does the work in making the film is what is important. Right now that is what continues to separate 'Disney' from 'Pixar'. Ramayana? Musicana? What are these? Are they just guesses or do you have inside info? Ramayana? This is an animated project that Disney is working on? Is it up on boards? Who is doing it? "Hi!! I know you from a italian forum!! I´m not really sure! But 'Snow Queen' is in storyboards revision by Lasseter last April 2007 or summer 2007 and Ramayana is only a rumor for 2012 with Musicana (a new Fantasia) because Disney/Pixar trilogy 'John Carter of Mars' for 2012 too, will be a live action film with background-animation and its for to present two animated movie each year. But... for disney 2011? I Think will be Snow Queen because is the favourite fable of Lasseter. Yes, I am italian and I write in a wonderful italian Disney forum. Glad you know it!!! I really hope you are right!! Snow Queen, based on HCA's story? Ramayana based on the old Indian tale? Wonder where you guys heard of that? Yahoo reports that it will be released in 2011, Christmas time.